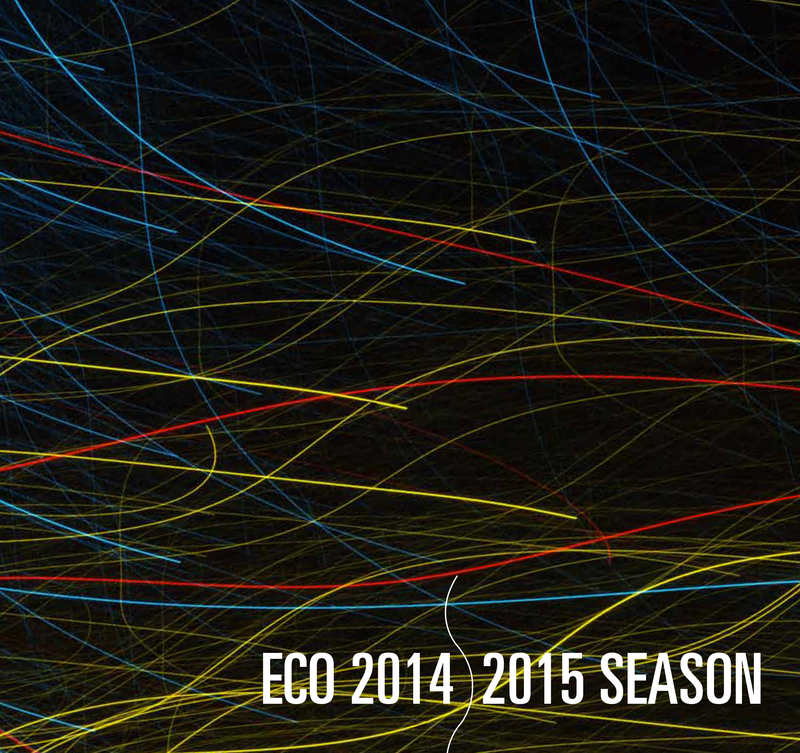 View our full 2014-2015 Brochure here! It is a pleasure to welcome you to the Erie Chamber Orchestra’s 2014-15 concert season. The remarkable momentum and artistic growth of this fine ensemble have been invigorating to everyone involved with this organization. You will find encapsulated within these pages our commitment to providing the very best in orchestral music to enrich and entertain our audience. In addition to masterworks by Bach, Dvorak, Kodaly, Ravel, and Schumann, the ECO will showcase three concertos composed by contemporary, award-winning American composers. 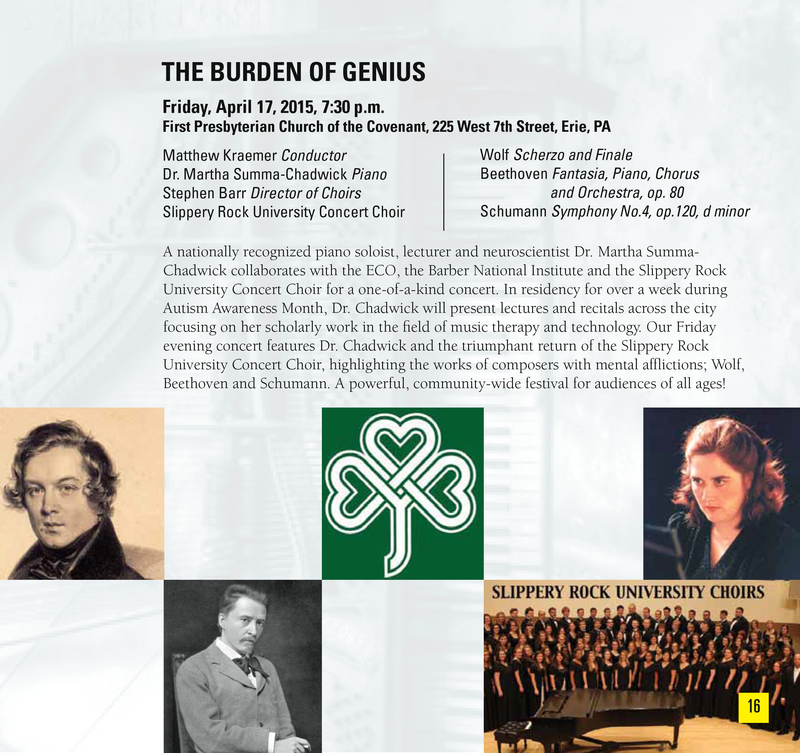 Four pivotal works by one of classical music’s luminary figures, Ludwig Van Beethoven, will showcase the remarkable growth and evolution of his music from 1804-1825. Following last season’s successful performance of Meredith Willson’s The Music Man, the ECO will present Mozart’s celebrated opera, The Magic Flute, in concert. Coinciding with the release of our first commercial recording featuring the music of early silent film composer J.S. 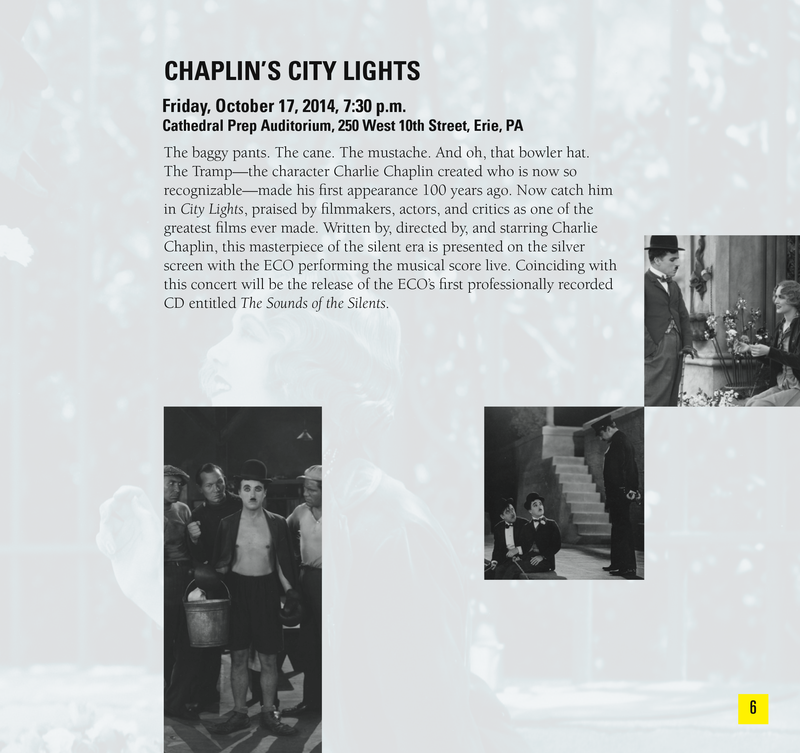 Zamecnik, the ECO will screen Charlie Chaplin’s City Lights, with the film score performed live. The ECO is additionally inaugurating a four-concert recital series with a variety of wonderful repertoire and talented performers. Acclaimed guest artists Roberto Diaz, She-e Wu, Bonnie Boyd, and others round out what will truly be our finest season ever. For 37 years the Erie Chamber Orchestra has provided great music free to the public and we hope that you will join us for each of these exciting performances.